There should be a word, perhaps one of those specific compound German ones, that describes the particular feeling of relief when a much-loved, decades-old venue reopens after a renovation and you realise that not only have they not screwed it up but have actually improved on the original. Such a word would be handy when walking into Bar Romantica for the first time. Taking over the space formerly known as Cafe Romantica, the new owners (some from Fitzroy North's Monty's) have not only honoured the venue's past via the name, but have renovated it in a way that's allowed it to reach its full potential. Retaining little more than the nougat-coloured terrazzo floor, the beaten copper kitchen canopy in the central open kitchen and the pool table down the back, the new fitout channels the inner north's European migrant 1960s espresso bar heritage. There are timber-panelled arches, a series of horseshoe booths and curving banquettes upholstered in red vinyl, flattering pendant lighting and a gorgeous curved front bar surrounded by red upholstered bar stools. It's the kind of room that murmurs: settle in. The other thing retained is the original Romantica's rare-as-hen's-teeth 24-hour licence. This means that the new kid keeps its status as an all-hours neighbourhood hangout but now adds thoughtful booze, solid cocktail-making skills and a more-than-decent food menu to the mix. 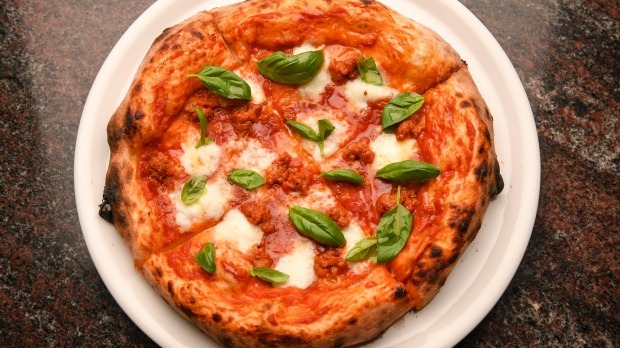 The smaller supper version that kicks in at 10pm means that a decent Pizza Romantica (passata, fior di latte and basil with optional 'nduja) or an excellent rough-chopped beef tartare made pleasantly fiery with fermented chilli can be yours until 5am at weekends. Run your eye over the back shelves of the bar and there's a reassuring weight to the collection. An entry-level martini might start at Tanqueray but there are a number of other excellent gins like Melbourne Gin Company and Sipsmith that make upgrading appropriate. There are similarly sterling names with the whisky, tequila and bourbon offerings plus a short, sharp collection of popular digestivi and, for those who like to keep it real over a game of (free) pool, old faithfuls like Jagermeister, for when only a dirty shot will do. All Bar Romantica's beer, both tap and packaged, is sourced from Victoria. The draft selection is one where you'd be happy to order any or all of them – Hop Nation Karma Oatmeal Stout and The Buzz American Red, Mornington Brown, Hawkers Pale Ale, Wolf of the Willows XPA and Blackman's Brewery lager. A small word of warning for the nasally sensitive. The kitchen canopy's retro good looks far outweigh its efficiency and things get smoky when the kitchen arcs up, meaning you might leave the place smelling like your dinner. Machine-washable clothing is advised. 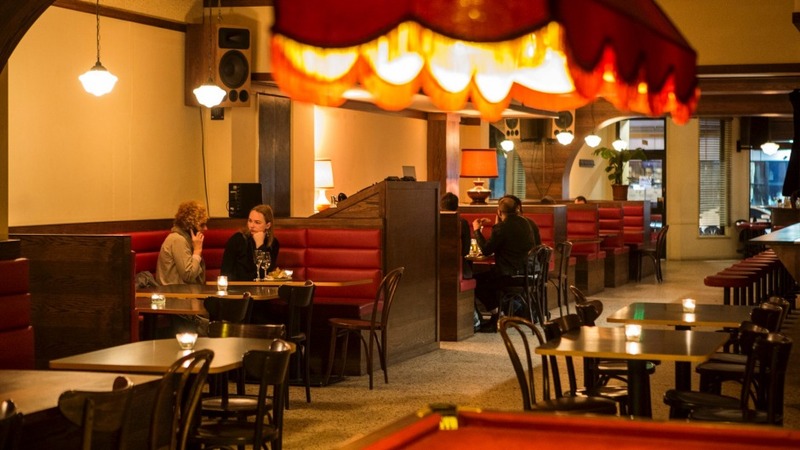 Bar Romantica should get a medal for its sensitive, switched-on rejuvenation of a classic alone. But points too for completely getting the brief and gifting Melbourne with an all-hours venue that understands hospitality, generosity and a sense of fun. 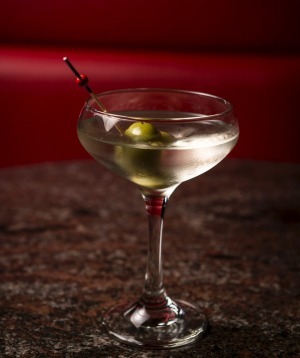 Tanqueray gin, Dolin vermouth, olives. Good level of chill, average olives, a decent selection of gin if you want to upgrade, $18. 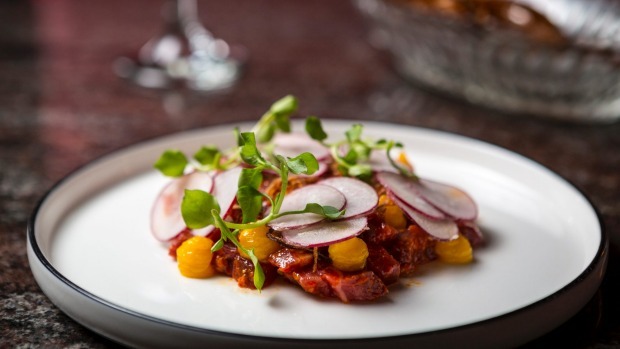 Go-to bar snack Tartare with fermented chilli, radish and egg yolk, $14.